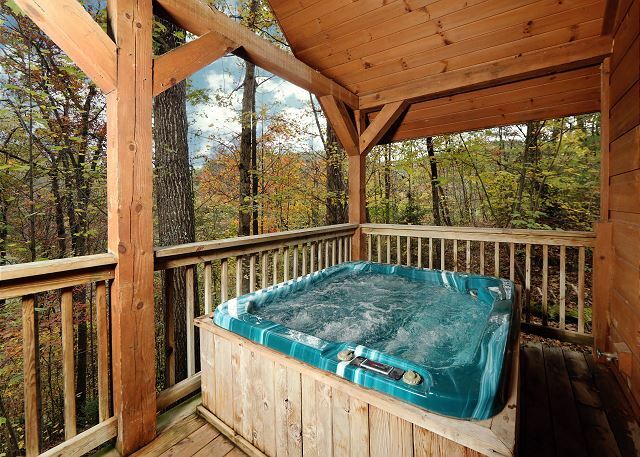 Smoky Mountain Getaway is a beautiful 4 bedroom, three and a half bath cabin located in Hidden Springs Resort, which is located in a mountain... VIEW NOW. "Beneath the Stars" #220 is a gorgeous 1 Bedroom, all wood cabin. 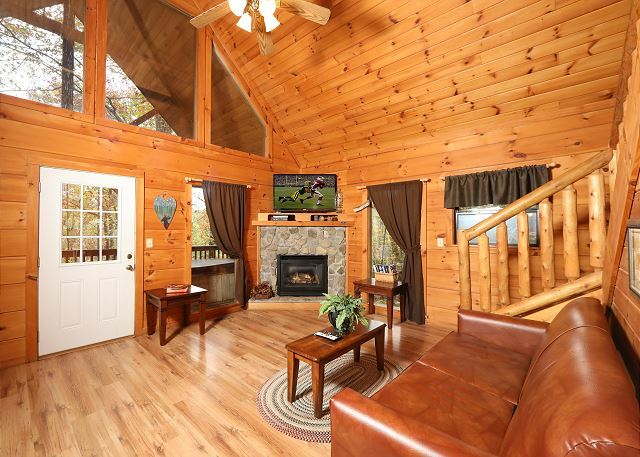 This cabin is not only semi private and surrounded by nature, it also offers all of the amenities you could ask for in your very own Smoky Mountain home away from home. 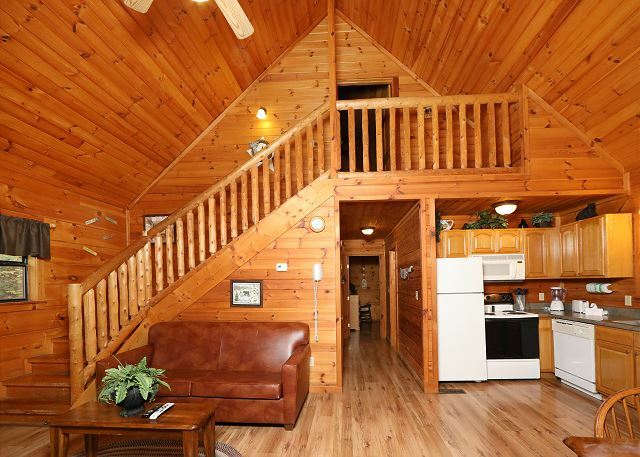 Located conveniently close to Dollywood & Splash Country, approximately 10 minutes from either Pigeon Forge or Gatlinburg. This cabin has paved roads all the way up to the gravel driveway. There is comfortable parking available for up to 2 vehicles. 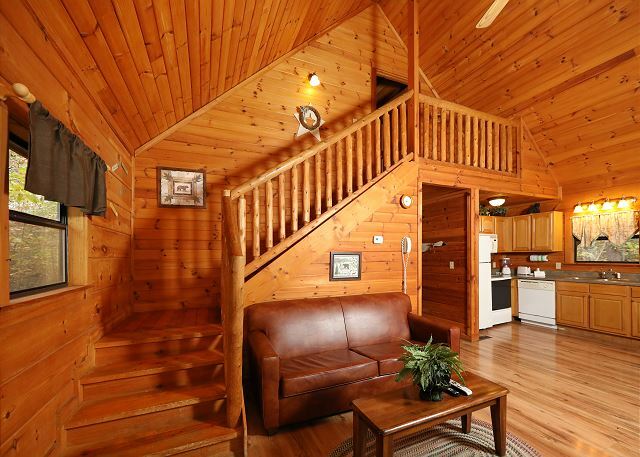 This 2 Bedroom, 2 Bath cabin that sleeps up to 8 is 2 levels. There are 7 steps to reach the main level. On the main level you will find a fully equipped kitchen with dining for 4, a living area with a Queen sleeper sofa, a stone gas fireplace, and flat screen TV. 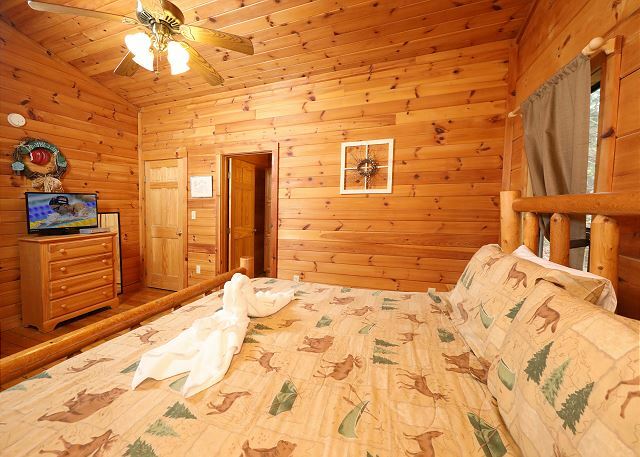 There is also a Queen bedroom with a flat screen TV, and a shared bath with a shower tub combo. The washer & dryer are also located on this level. 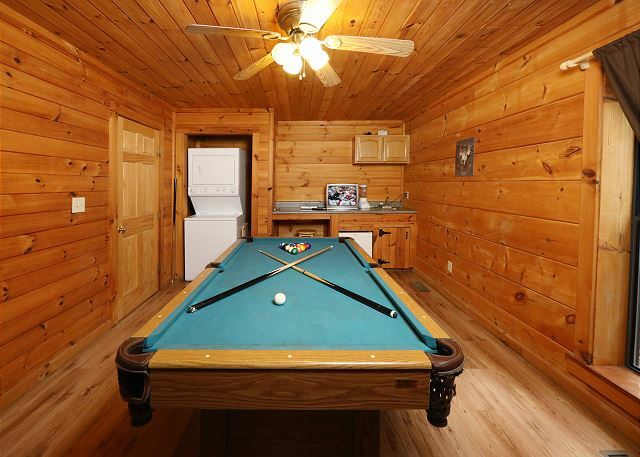 You will also find a game room with a pool table, TV, mini fridge, and bar seating. 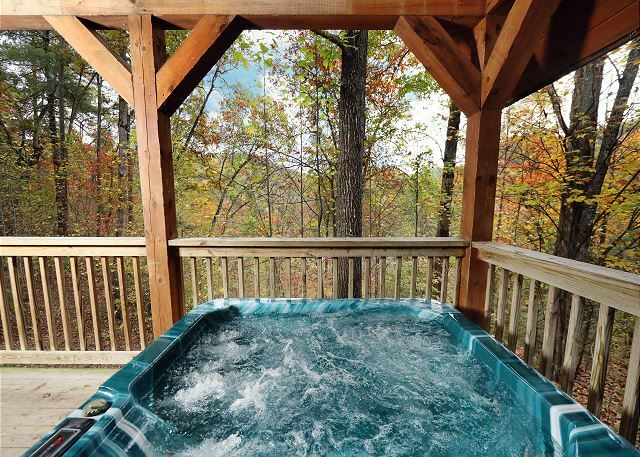 The main level deck holds the relaxing hot tub, gas grill, patio furniture, and offers beautiful views surrounded by nature. 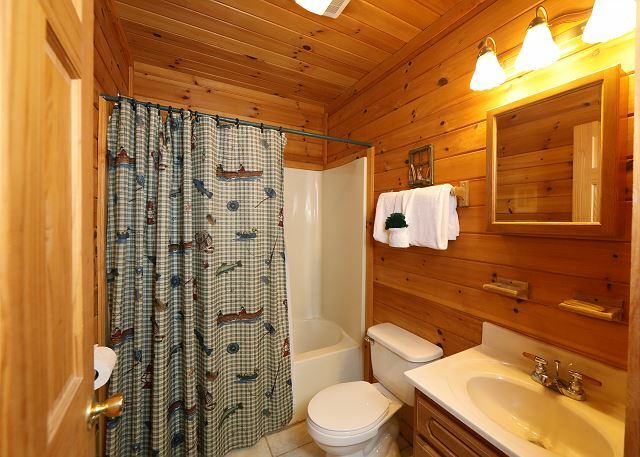 In the upstairs there is an additional king bedroom with a private bathroom with a shower / tub combo. All your vacation dreams can come true in “Beneath the Stars” Don't miss out --- Call us today to book this beautiful 2-bedroom retreat. ***There is a $75 + tax non-refundable pet fee for each pet. Max 40 pounds per pet and must be crated if left alone on the property. *** Price is up to 4 adults. Each additional person is $12.50 nightly. (Kids under 12 are free) Must be 21 years or older to rent this property. No Smoking or pets Please! Nearby Attractions Great Smoky Mountains, Hiking, Fishing, Shopping, Ziplining, Horseback Riding, Tubing, Kayaking, Swimming, Waterfalls, Go Karts, Putt Putt, Laser Tag, Snow Skiing, Water Skiing, Trails, Amusement parks, Water parks, Fly fishing, Caves, Caverns, Outdoor activities. Sightseeing, Family fun. 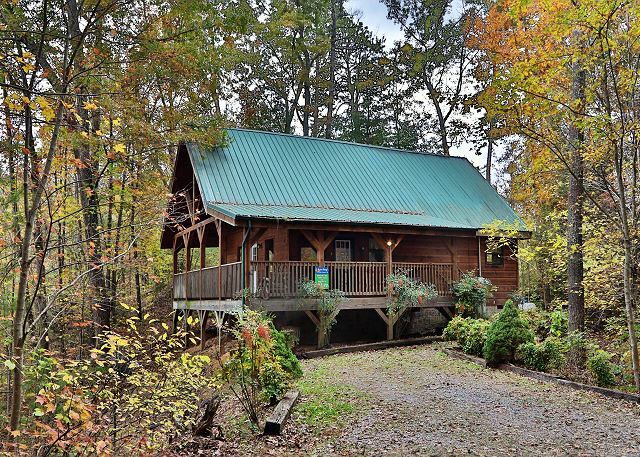 This cabin was convenient to Pigeon Forge and Gatlinburg. It is clean and well kept. Aunt Bugs checked in with us to make sure everything was going well. I would definitely recommend it. Would suggest more kitchen items to cook w/. A measuring cup would’ve been nice to have.. More towels, wash rags per person. Also would recommend to turn the air down before guests arrive. We spent two nights upstairs w little sleep due to it not cooling down quickly. Other than that absolutely loved our stay and was happy to be able to bring our fur baby w us. Cabin was exactly what I was looking for. Close to all attractions yet isolated enough to chill after a long day of adventures. Cabin was clean and provided everything needed. The cabin was exactly what we had wanted, expected, and could have hoped for. It was clean, instructions were clear. We had a wonderful time on vacation staying at an Aunt Bug's Cabin! It was clean and we felt comfortable. This was our first time to stay in a cabin in the Pigeon Forge area. 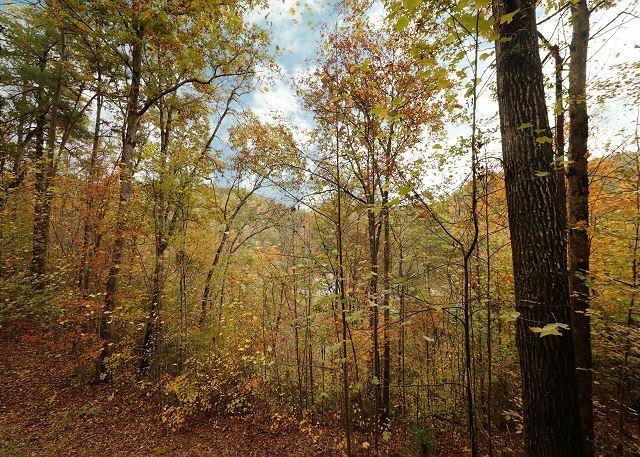 The location was ideal to both Pigeon Forge as well as Gatlinburg. The cabin was clean, comfortable, and just the right size. The property management company was extremely helpful and was quick to respond to a maintenance issue. The only negatives were being that the cabin was set up for at least 6 people and there were not enough dishes - barely enough for 3. Also it would be a great improvement if the owner would provide Wi-Fi or at least a local channel on the satellite system for news. Even with those minor negatives we had a wonderful time and would utilize Aunt Bugs again for a property rental. My family enjoyed the cabin. It was quiet, relaxing and had all the amenities we needed. We cooked out and enjoyed the hot tub. 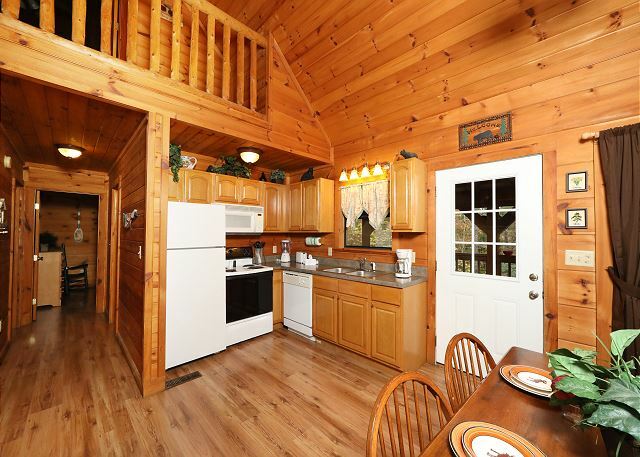 The cabin is close to everything - restaurants, outlets, parks and etc. - yet it's still secluded. Overall, we enjoyed the cabin experience and will return again, soon. We loved this little cabin. It was a peaceful quiet place to stay. The staff was very helpful to. We will definitely be coming back to this cabin soon. This is our second time using Aunt Bugs and we will again. This cabin was a bit smaller then expected, but we enjoyed everything. It was very clean and ready for a family. BEAUTIFUL and relaxing ! 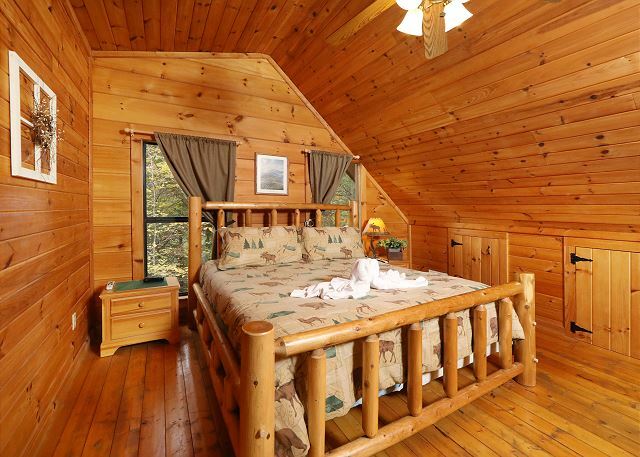 I wish I could live in our cabin !!!! 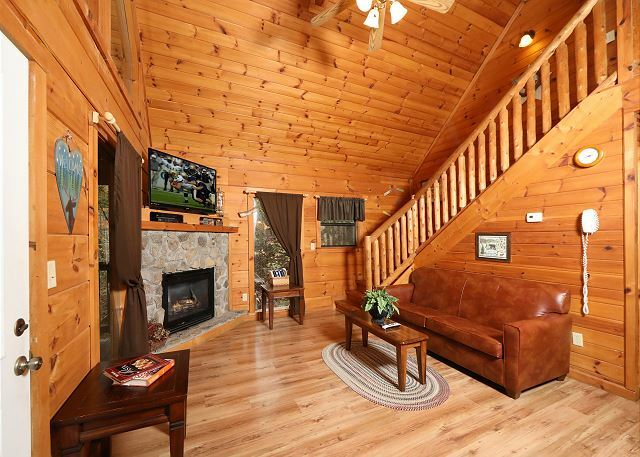 Lovely cabin, very clean and every thing you needed to have a great vacation. it was great that we could take our small dogs with us. Really enjoyed the cabin and will use Aunt Bug's services again. REAL GOOD , EVERYTHING THAT WAS SAID WAS WHAT CABIN WAS . We were very happy with our stay. Staff was very friendly and helpful. Cabin was very private and great for our dogs too. We look forward to our next trip and will be renting same cabin. We had a really good time at our cabin. The cabin was clean and as advertised. 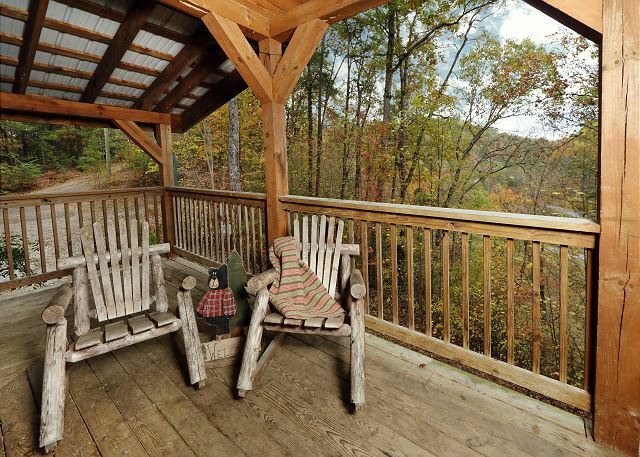 The deck was nice and we had a mostly secluded area and a nice view of the trees with a creek you could hear in the mornings and in the evenings. We went in the fall and you could see and hear the traffic below, but there wasn't much. If the leaves hadn't fallen you may not even be able to see the road. The living space was plenty for four people and the cabin was a lot of fun. The hot tub is a little small for four adults but it was still comfortable and we had a great time. The incline to get to the cabin is very steep so be careful in the winter or with a vehicle with front-wheel drive. There was a dicey moment when we first arrived and we were heavily-laden in the car but after that it was not a problem in a Honda sedan hybrid. 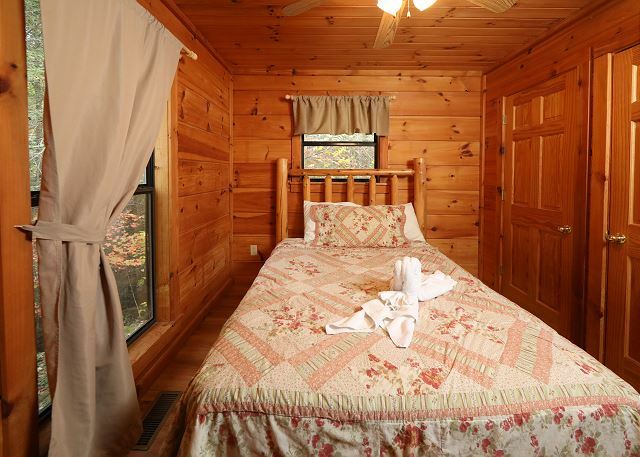 The cabin is a 10-15 minute drive to Pigeon Forge and Dollywood and not much further to Gatlinburg and the National Park. We checked in late but the staff made getting the key easy. We went with another couple and it was really well-sized for four adults. This was a very good cabin for all of us. Our daughter,her husband, and our granddaughter had a wonderful vacation, everyone enjoyed the privacy, not far away from Pigeon Forge, and all the places to eat and shop. It was everything I needed. No neighbors, no traffic. Great rooms and everything we needed and more. Good response from Company when a repair was needed. I felt very happy, safe, and relaxed. Had 2 problems the hot tub breaker had kicked out and the co had someone to fix it in an hour, great service. The gas fireplace needs fixing it needs adjusting. Great cabin and great customer service would rent ther again. 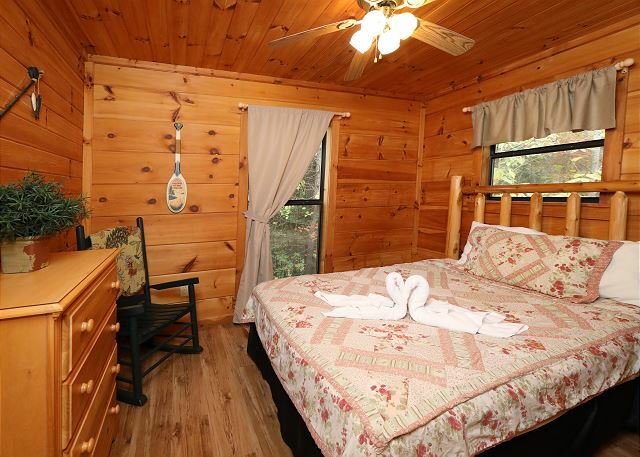 Very clean and nice cabin in between Gatlinburg and Pigeon Forge. It doesn't have the best views, but it is still a great place to stay and has plenty of room. We had two small complaints, the middle bar on the pull out bed was bent downwards making for a pretty uncomfortable nights sleep. The fireplace claimed to still be in service (they turn them off for the summer) but it would not work. We left notes for the property management company about these small problems. Had a nice vacation here. My family and I stayed at this cabin in April 2015 for 6 nights. 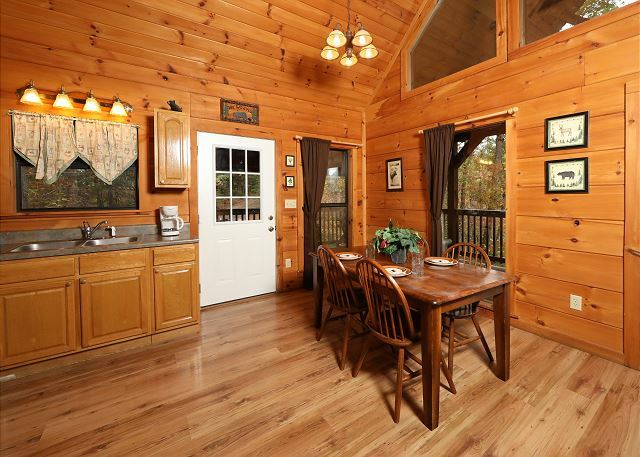 The cabin is away from the hustle and bustle of the busy cities - about a 20 minute drive to Gatlinburg and Pigeon Forge. Overall we really enjoyed this cabin and would stay again; however, we did report a couple issues. First, the upstairs bathroom plumbing is not vented correctly and would often smell of sewer gases - we had to keep the bathroom door closed most of the time and did not enjoy taking showers up there. Second, the dryer makes an obnoxious screeching and squealing noise while it runs. Third, the kitchen sink leaked water all over the place from the under sink plumbing. Finally, low water pressure issues caused the downstairs shower to barely trickle out water - leaving the upstairs shower (with the sewer smell) as the only viable option for showering. Despite these minor annoyances, our stay was very pleasant and we'd most certainly come back again if these issues are resolved. Aunt Bug's staff is very helpful, friendly, and professional - top notch in my opinion! Oh by the way - it would be GREAT if the hot tub cover had a mechanical arm attached to provide leverage to get the cover on and off. Since it doesn't, you have to wrestle the top on and off (not fun). 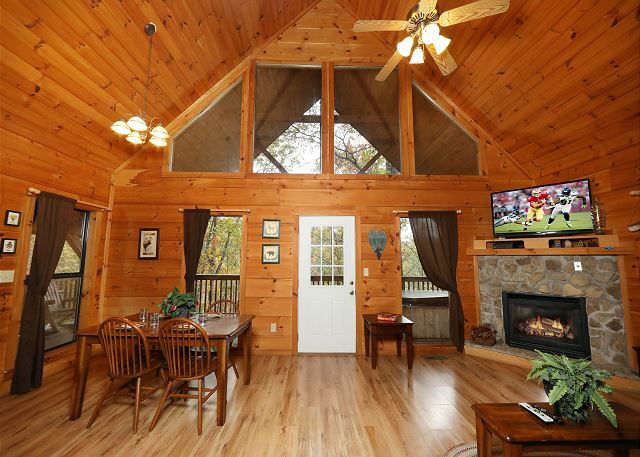 We had a fantastic time and truly enjoyed our cabin experience - it was peaceful and perfectly located half way between Gatlinburg and Pigeon Forge. Cabin was just as advertised! Nice cabin with all the amenities needed. Very clean and cozy. Perfect for our family of 4. The drive way was intense but we made it! Would have loved for the fireplace to have more of a roaring fire but loved our stay! Experience was exciting, a breath of fresh air, and an overall great getaway. Customer service on the phone and face to face was superb. I felt extremely welcomed and cared about through the telephone calls at the cabin during the stay. Definitely will be returning and spreading the good news about Aunt Bug's Rental. The cabin was nice. 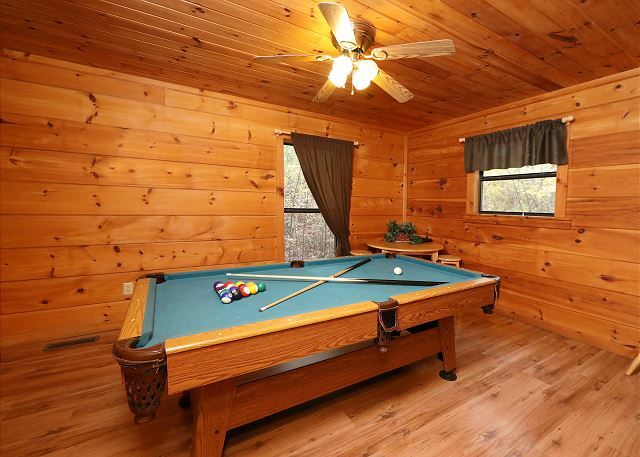 The pool table and hot tub were really nice extras. The only down side was that the cabin needed a really good cleaning , and one of the pool sticks was broken. The upstairs bathroom had an odor. We had a great time and it worked well for us last minute. We enjoyed our stay in Beneath The Stars #220. Nice cabin, well equipped and furnished. Will definitely consider staying here again. The staff at Aunt Bug's was very friendly, accommodating and organized. The check-in process was quick and easy and we were given detailed directions to our cabin. Thanks for a great experience! 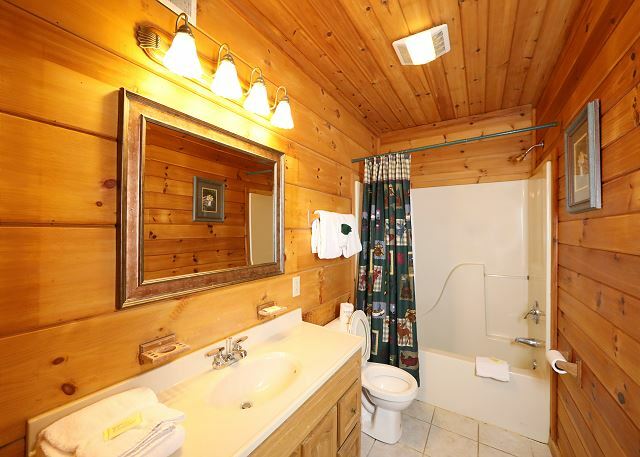 Love the privacy of cabin# 220. We've stayed in it several times. Will return again. The cabin was very clean but required some updates. The toilet leaked around the base each time it was flushed and the bathroom floors were very cracked but overall we were very happy with the cabin and the location. We have vacationed in the area many times but never stayed with Aunt Bugs before. We will definately deal with Aunt Bugs again. 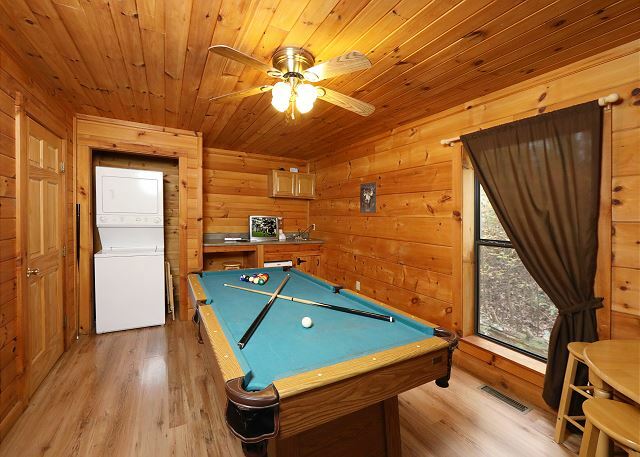 The cabin was clean and the hot tub was as well. Everything that the info said was in the cabin and ready for use. There was nothing we had to do and the attendant at the check in warned us of the steep hill and we were prepared. We really enjoyed our stay. The interior of the cabin was clean and fresh, however the exterior on the porch needed cleaning. There were holes from a woodpecker and wood shrapnel all over the porch and many spiderwebs and cob webs that have been there for a while. Lots of overgrowth and poison ivy at entrance to the cabin. Overall, we loved our stay and will return. Communication up to check in was outstanding. Staff was very friendly and helpful. Cabin was clean and organized. Jacuzzi not functioning. management helped correct issue. The cabin was very nice, clean and offered all we needed for our stay. Excellent! We truly enjoyed our stay in the cabin- beneath the stars! Thank you. The cabin was great we loved it! We will definitely book again! Very reasonable price for a 6day stay. Agency was great, cabin needed a little care but when we called mantience was there within an hour. Great!!!!!!! It was a wonderful weekend getaway for our family and we were able to take our fur-kids with us, which is always a plus. We loved the cabin and the hot tub was fantastic! Aunt Bugs customer service was great. Check in was speedy and mobile checkout was convenient to use. Cabin was just as described by the lady I spoke with from aunt bugs office. Check in was easy ang quick. Cabin was clean and very private. Only one concern but not a complaint. The cabin was close to a busy road so you could hear the vehicles passing by inside upon waking. The view was limited but good. Overall nice cabin and would use aunt bugs in the future. We were very satisfied with our stay.And would recommend Aunt Bugs to anyone. Check in was quick and easy. House was wonderful but driveway was very steep and a bit scary.